In fact, I have had it kicking around various classroom libraries and never read it because nothing about it appealed to me. But when a reluctant reader grabbed it, I said I would read it alongside him so we could discuss it. He finished it far more quickly than I did, but we both enjoyed it and he is off on a Gary Paulsen bender. 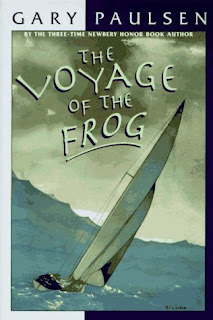 This is the story of David, a young boy who sets out on a sailboat to scatter the ashes of a beloved uncle. When a storm knocks him off course (and knocks him out), David spends nine grueling days surviving in the elements with barely any food or water. Since there's only one character, there is almost no dialogue and the pages look like large blocks of text. Daunting to many young readers, except those who love sailing and the outdoors so much that those blocks of text are invitations to imagine what they would do in a similar situation. For students like that, I am grateful for Gary Paulsen and all of his books. I'm not his target audience, but those readers need exactly these books.